Many investors include commercial real estate in their portfolio, yet there are few comprehensive resources available to those looking for information on how to profit in commercial real estate. 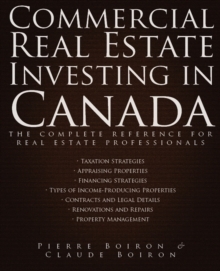 Written by a father-and-son team with extensive experience in buying, selling and developing commercial real estate, Commercial Real Estate Investing in Canada is a must-have guide for all real estate investors. This one-of-a-kind compendium will guide readers on such topics as: * The business of real estate * Land-use controls * Taxation of property * Types of income-producing properties * Renovations and repairs * Property management * Property appraisals * Conducting due diligence * Real estate contracts And much more! Commercial Real Estate Investing in Canada is a tremendously valuable and indispensable tool to all Canadian real estate investors, agents, brokers, property managers, landlords, loan officers, builders, and lawyers.